Having a ‘scoliosis’ means that part of your spine curves sideways. For most people this is picked up when they are a child and although you might be concerned that you could have prevented it from happening, this isn’t the case. Scoliosis isn’t caused carrying a heavy school bag, slouching or sleeping on your side. In fact, it’s not caused by anything you may (or may not) have done and we don’t actually know why it develops in some people rather than others. In some cases, the sideways curve may be very pronounced and treatments such as a brace or surgery might be recommended by a scoliosis specialist. For lots of people, however, having a scoliosis doesn’t cause significant pain or health issues and once you have stopped growing it’s unlikely to get any worse. 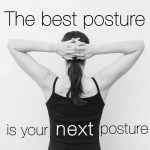 You can’t reverse the curve in your spine with pilates exercise but a targeted programme can teach you how to release tight areas of your spine, improve your awareness of alignment and strengthen the internal muscles that support and control your spine. Lie on your back with your knees bent and a slight curve under your lower back. Breathe in to prepare, breathe out slowly and tighten your pelvic floor muscles by imagining you are stopping yourself from passing wind. Forget about your pelvic floor for a moment and this time as you breathe out, tighten your deep abdominals by drawing your tummy muscle away from the line of your trousers slightly. Kneel on all fours. Breathe out and tuck your tailbone under, curving your spine. Breathe in and hold. Breathe out and lift your tailbone, drawing your shoulders into the back of your body. Breathe in to hold. Repeat 10 times. Kneel on all fours. Move your tailbone to the right and look back towards this side, stretching your side. Move your tailbone to the opposite side to stretch the other way. Repeat 5 times each side. Tips: you can increase the stretch by moving your feet as well as your tailbone. Kneel on all fours. Tuck your tailbone under slightly and draw in your pelvic floor and lower abdominals. Breathe out to slide one foot along the floor away from you, without moving your back or pelvis. Breathe in to slide back again and repeat on the opposite side. Repeat 10 times each side. Stand up and place your fingertips on the bony points at the front of your pelvis. Take your weight onto one leg, keeping these bones level and hold for 10 – 15 seconds. Repeat on the other side. Not all pilates exercises will be recommended and some actually may be uncomfortable, so it’s important to understand how to make your own individual adjustments if you are planning to go into a class. A physiotherapist or pilates instructor specialising in clients with scoliosis will be able to write you a programme of ‘self-corrective’ exercises specifically designed for your particular type of curve. Give us call if you have any questions.